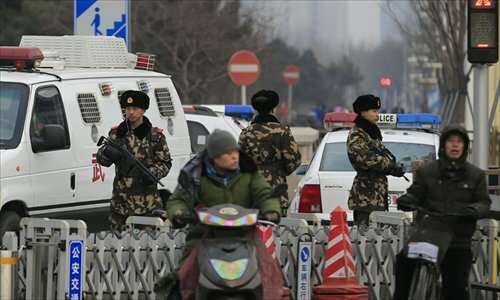 China's newly adopted Counter-terrorism Law does not target any specific region, ethnic group or religion, a legislative official said Sunday, stressing that the legislature has strived to seek a balance between empowering the country's anti-terror efforts and reducing the possible impact on citizens' legal rights. "To fight terrorism, China will deploy necessary means for law enforcement, but at the same time, the law enforcement process will be regulated, so as to prevent it from hurting citizens' and organizations' legal rights," Li Shouwei, a deputy director of the criminal law department under the National People's Congress (NPC) Standing Committee legislative affairs commission, said at a press conference at the end of a week-long session of China's top legislature. After a year-long process of three reviews and draft revisions, the NPC on Sunday finally passed the law that will take effect on January 1. Li pointed to a provision in the law which stipulates that religious freedom and ethnic customs and traditions should be respected during the execution of counter-terrorism measures. "No discrimination based on regional, ethnic or religious affiliation shall be allowed," the law says. To prevent abuse of power in counter-terrorism efforts, the law stipulates that those who are defined as terror groups or members have the right to apply for reassessment of such definition, or file for administrative action. If the legal rights of an organization or individual are harmed during a counter-terrorism operation, they should be given compensation according to the law, said Li. The law stipulates the creation of a national leading organ for counter-terrorism work, which will be in charge of identifying terrorist activities and personnel, and coordinate nationwide anti-terrorist work. A national intelligence center will be established to coordinate inter-departmental and trans-regional efforts on counter-terrorism intelligence and information. Technological means of reconnaissance for gathering counter-terrorism intelligence and information can be used following strict approval procedures, the law stipulates. It adds the information obtained in this way should only be used for investing, prosecuting and trying terrorist and extremist crimes. Those who breach individual privacy or leak State secrets and confidential business information will be punished. The law stipulates that authorities should rely on the public and strengthen resources to collect information at the grass-roots level. The new law comes at a delicate time for China and for the world at large, as terror attacks in Paris, the bombing of a Russian passenger jet over Egypt, and the brutal killings of hostages by the notorious Islamic State (IS) extremist group raise alarm over an ever-growing threat of terrorism. The passing of a law specifically addressing counter-terrorism is a timely and necessary move for China to crack down on surging violence that involves the infiltration of the members of the East Turkestan Islamic Movement into the country. It also provides a solid legal basis for China's cooperation with international anti-terror efforts, An Weixing, head of the counter-terrorism bureau of the Ministry of Public Security, said at the press conference on Sunday. Before the passage of the bill, China did not have a specialized counter-terrorism law, though related provisions were included in various NPC Standing Committee decisions, as well as the Criminal Law, Criminal Procedure Law and Emergency Response Law. China studied US and European Union laws in drafting its own counter-terrorism bill, which requires tech firms to assist security authorities to prevent and investigate terrorism, Li said Sunday, acknowledging that a number of countries and enterprises had voiced concerns about certain provisions in the law. He pointed to Article 18 of the new law, which requires telecommunications operators and Internet service providers to offer technical support and assistance, including decryption, to police and national security authorities in preventing and investigating of terrorist activities. Li said the rule conforms to the actual needs of fighting terrorism and is basically in line with the practices in other major countries. "The clause reflects the lessons China has learned from other countries and is finalized after wide solicitation of public opinion," he added. "(It) will not affect companies' normal business nor install backdoors to infringe intellectual property rights, or citizens freedom of speech on the Internet and their religious freedom," Li said. The law also makes it legal for China's People's Liberation Army (PLA) to get involved in anti-terror operations abroad. According to the law, the PLA and China's armed police forces could carry out counter-terrorism missions overseas with the approval of the Central Military Commission. Public security and national security authorities can also send personnel overseas on counter-terrorism missions, but these must be approved by the State Council and agreed upon with the countries concerned.